Garage Door Repair Claremont, CA ― Your garage door is the largest moving appliance in your home. It is built to protect your belongings, home, and entire family. Garage doors are very heavy, and are not a children’s toy. Read on to learn how to work around a heavy garage door. Regardless of the material with which your garage door was made, it weighs over 100lbs. Single doors weigh a minimum of 130 lbs, while double doors can weigh up to 350 lbs. More modern garage doors, such as glass doors, can weigh over 400 pounds. Counterweight systems are installed to make raising and lowering garage doors easy. These systems are made of torsion or extension springs that carry most of the weight of the door. Springs don’t last forever. Over time they will wear off and lose their elasticity. It is recommended that you change the spring system after 10,000 cycles (one cycle = 1 open + 1 close). The average homeowner with a single-car garage uses 4 cycles per day. So, this brings the spring life expectancy to about 7 years. The life expectancy for the average double car garage is about 5 years. These are not guarantees, however. Your spring could have a shorter lifespan due to a number of things, such as mishandling or lack of maintenance. 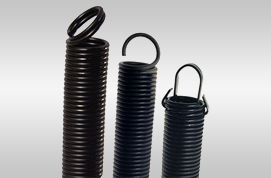 Lubricating your spring system on a yearly basis can extend the lifespan quite a bit. Apply car oil to your springs, such as 10W30. Remove any excess oil. This will also prevent noise that springs make over time from extending. If the counterweight system isn’t functioning or if the balance of your garage door is off, your electric garage door opener can take over, though this has consequences of its own. Without a counterweight system, a door opener can lift up to 200 pounds… While making so much noise it scares you. Avoid this by completing a spring system check twice per year. Pull the emergency cord on your door opener and lift your garage door gently. A balanced garage door weighs 10-15 pounds, which can easily be lifted with one hand. Have a maintenance done to your garage door every 6-12 months. Check out our Garage Maintenance Checklist for a complete guide on how to properly check your door. Also, be sure to CONTACT US to inquire about our preventive maintenance program. We can fix a heavy garage door to make it safe and easy to use!